PT Pupuk Kalimantan Timur - PKT or referred to as "Pupuk Kaltim" is an established fertilizer and petrochemical company in Indonesia. Based in Bontang East Kalimantan, Pupuk Kaltim is under PT Pupuk Indonesia Holding Company (Persero) or PIHC Group, a state-owned fertilizer holding company in Indonesia. At present, PIHC Group is the majority shareholder at PT Pupuk Kaltim with 99.99% of ownership. Other 0.01% remaining shares was owned by Yayasan Kesejahteraan Hari Tua Pupuk Kaltim (YKHT Pupuk Kaltim). Pupuk Kaltim is widely known nationwide as one of the largest fertilizer producers in Indonesia. At present, Pupuk Kaltim installed total annual production capacity of 3,435 million tons urea and 2,740 million tons ammonia. Pupuk Kaltim now has 3 representative offices (Jakarta, Balikpapan, and Samarinda) and 13 marketing offices throughout Indonesia. Pupuk Kaltim also supported by 12 subsidiary companies and 5 affiliateed companies . In term of financial performance, Pupuk Kaltim recorded a satisfiying financial result in 2016. According to information found in PT Pupuk Kalimantan Timur Annual Report 2016 as cited by JobsCDC.com, Pupuk Kaltim reported total assets of Rp 29,390.54 billion in 2016. This represents an increase of 23.5% versus 2015, when the company's total assets were Rp 23,801.66 billion. Pupuk Kaltim's comprehensive income for the year 2016 rises to Rp 8,634.06 billion from Rp 2,120.22 billion in 2015 . Local resident Bontang with valid ID Card Bontang. Maximum age of 25 years old for S1. Maximum age of 21 years old for SLTA. Minimum GPA of 3.00 out of 4.00 for S1 and D3. Minimum average national exam score of 7 for SLTA. Statement letter ; free from drugs. Note : application form and statement letter can be taken at the Office of Dinas Penanaman Modal Tenaga Kerja dan Pelayanan Terpadu Satu Pintu Kota Bontang. JobsCDC.com now available on android device. Download now on Google Play here. Please be aware of recruitment fraud. The entire stage of this selection process is free of charge. 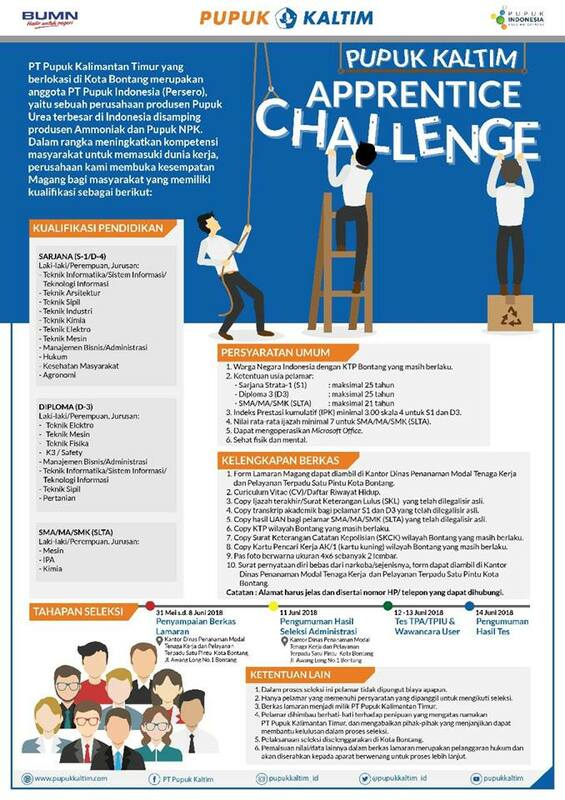 PT Pupuk Kaltim - Fresh Graduate Apprentice Challenge Program Pupuk Indonesia Group June 2018 will never ask for fees or upfront payments for any purposes during the recruitment process such as transportation and accommodation.